RockIT Repairs™ Inc. a local Veteran Owned small business would like to wish all of its customers a Happy Holiday! To show our appreciation this holiday season, RockIT Repairs™ will be giving away some of the hardest to find toys for your little ones every Monday until Christmas. We have three giveaways running through December 22nd of this month. 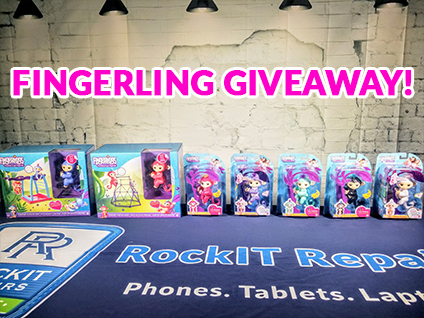 RockIT Repairs™ is giving away Fingerling toys this Christmas! To be entered into our contest you must first click here to go to our Fingerling Giveaway post, share the post and in the comments below the post, tag three of your friends that would also love a Fingerling toys this Christmas. Winners will be drawn Friday December 22nd at midnight! Call today for a quote on your device!